We’ve missed him…..and a bunch of you did, too. But we’ve got him back for the 2015 West Coast ‘Ukulele Retreat, to be held May 13 – 17 at Asilomar in beautiful Pacific Grove, California. In case you don’t know already, Jim D’Ville is an internationally acclaimed music educator and facilitator who is on a mission to break the bond between ukulele players and the dreaded “paper,” by teaching them how to Play by Ear. And he does it with so much fun, charm, energy, and charisma that you are laughing and learning at the same time. 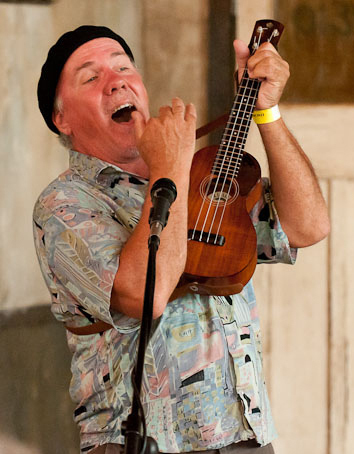 He has taught his “Play Ukulele By Ear” workshops to thousands of players in the United States, Canada, and Australia and has been featured numerous times at the West Coast ‘Ukulele Retreat, Wine Country ‘Ukulele Festival, Camp Oo-Koo-Lay-Lay, and more. He is the author of the “Play Ukulele By Ear” DVD series and hosts the popular Play Ukulele By Ear website and has been featured on Oregon Public Broadcasting’s “Oregon Art Beat” and Kamuke Magazine, and he is a regular contributor to James Hill’s e-magazine, Ukulele, Yes! In addition to his popular “Play Ukulele by Ear” workshops, Jim will be bringing us some new classes for more advanced players, “Fiddle Tunes” and “Surf Ukulele” by ear, as well as a new workshop on the songs by Hank Williams and Buck Owens. (How would YOU like to have a tiger by the tail?) And, as those of you who already know him know, he is quite the ukulele merry-maker! And Jim D’Ville is just one member of the internationally acclaimed staff we have lined up for you this year, which includes Del Rey, Rick Turner, Daniel Ward, Kevin Carroll, and Dave Egan. All in all, it’s a recipe for the most fun you can have with your ‘ukulele on! Stay tuned, open registration is just a day or two away! ~ by UkuleleLady on December 6, 2014.